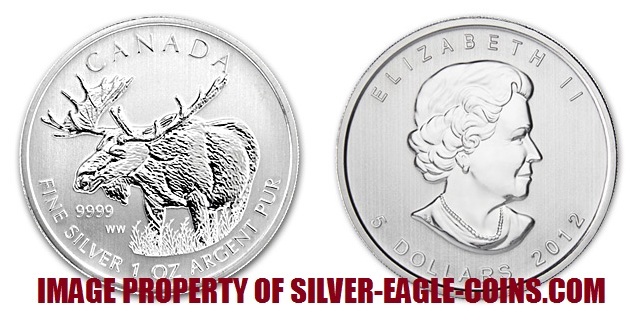 The Silver Eagle Coin Company is pleased to offer 2012 Canadian Silver Moose Coins. The 2012 silver moose coin was the fourth coin released in the Royal Canadian Mint's all-new "Canadian Wildlife Coin Series" program. Each coin is gem brilliant uncirculated with a gorgeous "reverse-proof" finish and is 38 mm in diameter. Each coin contains one ounce 0.9999 pure silver, with a $5.00CAN face value per coin -- making it a "legal tender" coin in Canada. Obviously, the face value is largely symbolic since the intrinsic silver value is much greater than the face value. Each coin will be shipped in a 2x2 non-PVC safety flip unless you buy 25 coins which would come in their original Royal Canadian Mint tube. The coins also fit into our 38 mm plastic capsules (sold separately in packs of ten holders).